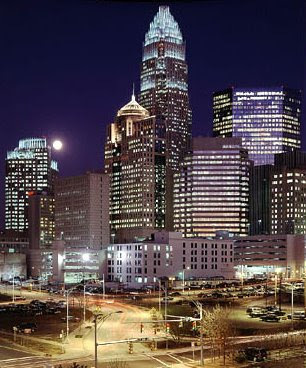 Greetings from the Queen City! It is hard to believe that (in what seemed to be the blink of an eye) we are back in the states after a whirlwind expatriation in New Zealand! Kicking the jet lag from our recent relocation has been harder than expected; perhaps it’s my body’s way of holding on to Auckland as long as possible. However, Charlotte is a lovely city to be courting and I'm sure we will soon find it to be home. In the first few days of our new life here, we have discovered that Charlotte has warm southern charm and welcoming friendly faces everywhere you turn. And despite missing all my mates back in NZ, it has been fun “rediscovering” all my old American favorites. Grocery shopping was better than Christmas morning! I swear I threw vanilla coffee mate into the cart with the glee of a child opening their first bike. Although I grew to love a good flat white, I missed my American filtered coffee terribly and it tastes SO good! Another requisite shopping excursion we took within the first 24 hours on US soil was to Target. This purveyor of all things affordable and fun had me in a tizzy with all the new eco friendly products they now carry. It was fun to browse the aisles with a new found appreciation for the choices available in this country. And lastly, on the top of our to-do list, was to get some good Mexican food. We could not wait until Cinco de Mayo for a fiesta so we headed over to Cantina 1511 in Charlotte’s Dilworth area for what we heard to be the best Mexican around. Our palate had been craving some real salsa and tortilla chips for so long that I think we shocked the waitress with our enthusiasm. Along with all the excitement of this move, I’ve been revaluating how I’d like to continue with Pink to Green. My eco-friendly finds and favorites will not be vanishing anytime soon, but I hope to also start including some posts on broader topics. There are some very exciting things on our horizon so I hope that you’ll join me for the ride and keep checking in to find out what comes next. Thank you for all of your wonderful comments and well wishes for our move- it has been wonderful encouragement! Vanilla Coffee Mate (I like Hazelnut,same same! ), Target, and REAL tortilla chips, isn't it good to be home? I know that exact exact feeling of joy in the grocery store, like when I saw banana nut cherrios for the first time, the things they invent while you're away, its' CRAZY! I was in Target on Saturday morning. Two little boys hanging out of the cart with an animal cracker trail around the store. did you see me? see you soon! Hi! I just found your blog and I can't wait to read all of it! Welcome back to the US. It's funny some of the things we miss when we're away isn't it? Have a great day! How funny! Target was about the first place I went when I moved back to the States... and promptly ran into two friends there!